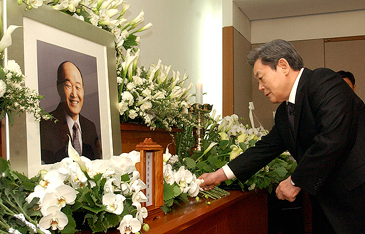 Samsung Chairman Lee Kun-Hee pays respect to the late Chairman Chung Se-Yung at Chung's funeral May 22, 2005. SHANGHAI, May 22, 2005 — Chung Se Yung, the man who helped build the Hyundai Motor Company of South Korea into one of the world's biggest car makers, died in Seoul May 21, 2005 . He was 76. Mr. Chung died of pneumonia at the Asan Medical Center in Seoul, said a statement by Hyundai Development Company, part of the powerful Hyundai Group of companies run by Mr. Chung's family. Mr. Chung was placed in charge of a tiny car operation at the Hyundai Group in 1967, and in the span of 30 years he helped turn it into one of the world's biggest car companies. Last year, the Hyundai Motor Company had revenue of about $27 billion and sold about 2.2 million cars. By helping turn Hyundai into a global brand, Mr. Chung and his family became some of South Korea's richest and most influential businessmen. The Hyundai Group is South Korea's largest conglomerate. But in recent years, the Chung empire - which includes construction, electronics, shipping and car divisions - has been shaken by financial problems and family scandals. Mr. Chung lost control over the Hyundai Motor Company in 1999, when he and his son were forced out by his older brother — Chung Ju Yung — who had founded the Hyundai Group in 1947 as an engineering and construction company. Chung Ju Yung's eldest son, Chung Mong Koo, was named chairman of the Hyundai Group and the motor company. But partly because the company was heavily in debt, the South Korean government later forced Hyundai to downsize. As a result, the Hyundai Group was divided into five groups, including two major divisions. Chung Mong Koo now controls the auto company. His brother, Chung Mong Hun, controlled the electronics and construction and engineering division until August 2003, when he committed suicide by jumping off the 12th floor of the Hyundai headquarters while under investigation for illegally transferring money to North Korea. Chung Ju Yung died in 2001 at the age of 85. Chung Se Yung was born in what is now North Korea on Aug. 6, 1928. He graduated from Korea University and then earned a master's degree in political science in the United States from Miami University in Oxford, Ohio. 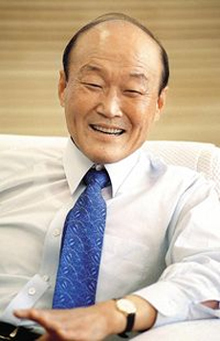 He returned to what had become South Korea and joined the Hyundai Group in 1957, working first in the engineering and construction division - then the company's biggest arm - before being asked by his older brother in 1967 to take charge of an automaking unit. Hyundai Motor Company worked first with foreign carmakers like Ford. But in 1976 it produced and built its own car, the Pony, which became popular with South Korean consumers and was eventually exported to the United States as the low-priced Excel in 1986. The car's success in the huge American car market helped make Hyundai a global carmaker. Mr. Chung ran Hyundai Motors until he retired in 1996. His son was appointed to replace him. From 1996 to 1999, Chung Se Yung served as honorary chairman of the larger Hyundai Group. But in 1999, after Hyundai acquired Kia Motors, family quarrels broke out over who would control the Hyundai empire, and Mr. Chung and his son were ousted from the motor company. Mr. Chung had surgery related to lung cancer in 2000. He is survived by his wife, a son and two daughters.